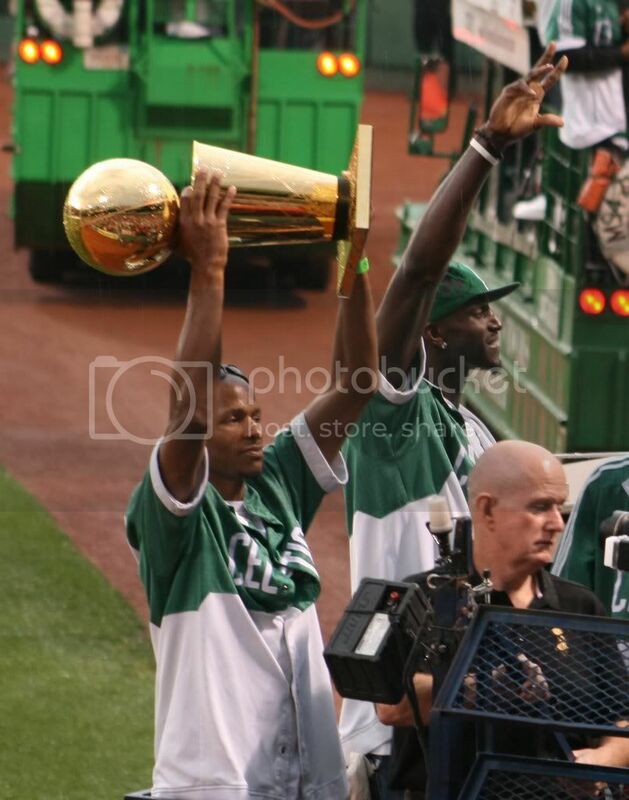 The Boston Celtics won the NBA title on Tuesday June 17, 2008. 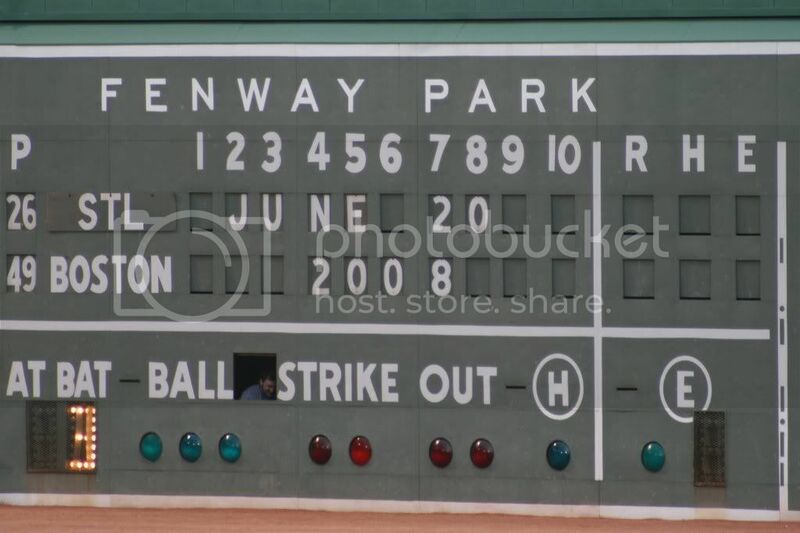 I attended a Red Sox game at Fenway on Friday, June 20th. It was the first game at Fenway since the Celtics won the title and there were plenty of pre-game festivities. The truth of the matter is that my seats weren't really all that great for watching the game (we had one of the notoriously terrible Fenway sightlines from the rightfield corner), but they were perfect for watching the Celtics circle the field in duckboats. I am not a huge NBA fan, but I have always been a fan of Kevin Garnett. 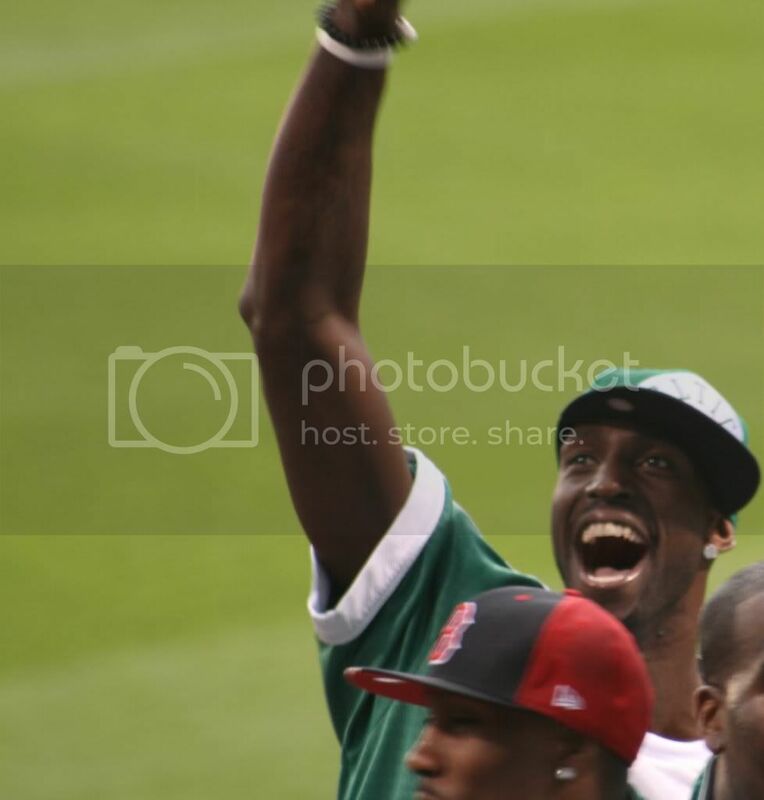 I took a lot of pictures of Garnett at Fenway and there isn't a single one where he isn't beaming. The whole team was happy, but there seemed to be more with Garnett - joy, relief, validation, whatever - it was a lot of fun to watch. In the end, power from unlikely sources for the Cardinals (homers by Jason LaRue - .228/.337/.329, Skip Schumaker - .305/.363/.435, and Yadier Molina - .290/.347/.382) trumped power from unlikely sources for the Red Sox (homerun by Julio Lugo - .275/.364/.346 - first homer of the season) and the Cardinals won 5-4. By the way, you may have noticed that both Jason LaRue and Yadier Molina were in the game for the Cardinals. 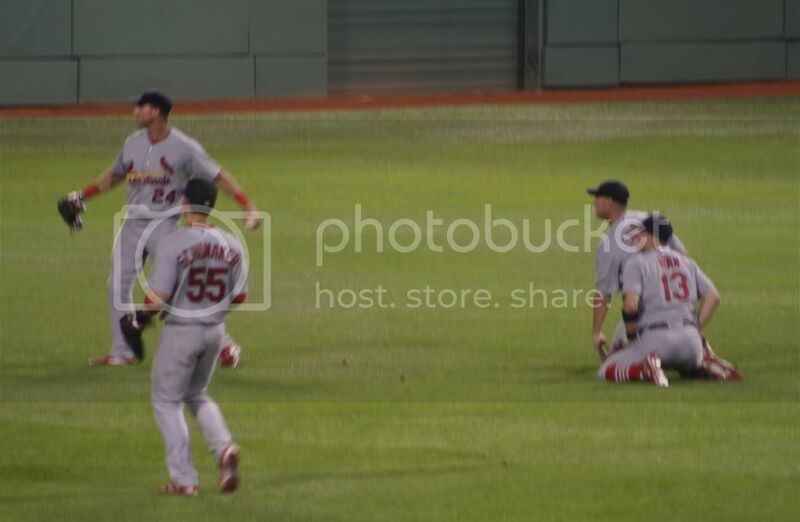 Molina was the DH and LaRue started at catcher, presumably because Molina was coming off of a concussion. While the move worked to the Cardinals advantage, I really couldn't understand the thought process. The Red Sox had Wakefield, a soft-throwing righty, on the mound and the Cardinals had Brian Barton, Aaron Miles, Brendan Ryan and Molina to choose from for the DH (assuming that LaRue was starting at catcher because of Molina's concussion). But between those four guys, I'm not sure how Molina was the correct choice. If LaRue had gotten hurt, then the DH position is burned when you move Molina to catcher and I don't think that the upgrade in ability from Barton to Molina, Ryan to Molina or Miles to Molina (if there is any), is worth that risk. If any other player had gotten hurt (and Izturis actually did get hurt, bringing Ryan into the game), the other bench players could be shuffled to cover the position so as not to have to burn the DH, but not catcher.